There are three upsides to being sick. 1. Taking care of each other. Not only is it a privilege to get to take care of another person (or, in this case, three other persons) in their weakest, most vulnerable moments, it is a really touching thing to have someone take of me. My favorite moment: I was lying on the pullout sofa in the middle of the living room and the boys were jumping and crawling all over me. My Old Man explained to them that mommy had a tummy ache and they needed to be gentle. Little Buddha then prodded me on to my side and began to rub my back. Then Tiny Dancer wanted a turn. They just kept taking turns rubbing my back. It was so sweet I wanted to cry. 2. Losing weight. I lost 2.5 pounds in one day. I know it’s not permanent, but man it makes me grin to see the scale dip down like that. I know. I’m very vain. And caught up in things that shouldn’t matter. Yeah, I’m like that sometimes. 3. Feeling better. The great thing about being sick, is that when you start to feel better, it is such a contrast to how you had been feeling that you feel like you feel really really good. Or at least I do. I realize I probably only feel just as good as I did the day before I got sick, but relatively speaking it just feels so much better than that. In fact, I felt so good that I decided I could make a trip to my LYS. Just to get some needles for the felted clogs I’m going to make (since the children’s clogs require 16″ circs and my new KP Options do not offer a 16″ option). I really, really only meant to buy needles. Really. But, well, plans changed. Yup. 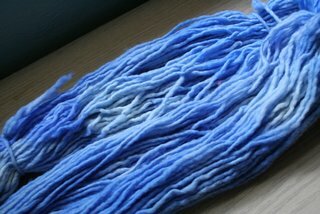 That’s Malabrigo. Jewel Blue. 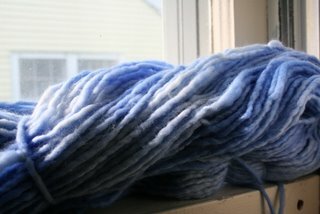 I got 6 skeins of it. It’s going to be the Zippered Raglan Cardigan from LMKG for My Old Man. I think this is going to be a perfect color on him. Remember what I said yesterday about Lorna’s Laces maybe being my favorite yarn? Okay, so maybe that was an exaggeration. Maybe I should’ve clarified that Lorna’s Laces is my favorite machine washable yarn. Or my favorite yarn for socks. Or my favorite yarn that my LYS doesn’t carry. Wanna see the Jewel Blue a little closer? Is that yummy, or what? Come on, come a little closer. Yes, I agree, it does look like a little piece of heaven fell into my hands. Oh, and that wasn’t the only piece that came raining down on me. Here’s a little Polar Morn. 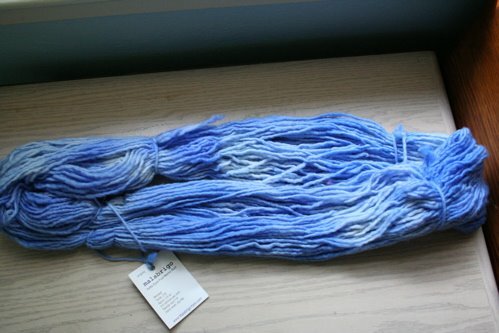 Just one skein that I had to have. 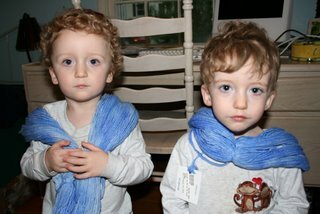 It might be the bumper for my boys’ clogs, or it might be a striped edge in My Old Man’s raglan. I couldn’t decide, but I had to have it. Just looking at it made me think of sitting on a porch at a northern lake wrapped in a thick wool blanket sipping a cup of hot coffee while the morning fog floats over the water. Um, yeah, I get a bit carried away in the yarn store. The yarn looks beautiful! Glad that you’re feeling better. Yum, yum, yum. Love those colours! Ah, Mmmmmmmmmmalabrigo! What a wonderful sweater that will make. It’s too scrumptious for words! I’m happy to hear that you are feeling better…such sweet boys! Girl, that sweater is going to look smashing in this yarn!!!!! 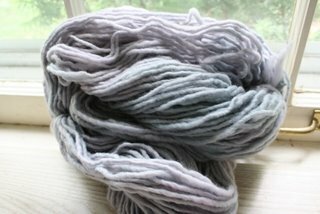 I’m glad you are feeling better – there is nothing better than some Malabrigo therapy!! Those colors are stunning and are going to make a beatuiful sweater. We can definitely tell you’re feeling better now that your energy to fawn over yarn has returned! I mean, if you weren’t fawning over that gorgeous stuff, we’d know there was really something wrong with you! Excellent acquisitions, I’d say.